Two words that brought me hope as a parent and caused me a deep sense of guilt. I just had to talk on the phone in the presence of my children to know that it was my attention they wanted, without any distractions, and I knew if I could deliver that, they would behave. It gave me hope. In reality, I had three children, four and under, and a house to run, and a job on the side, and a husband that was never present, and a family who perpetuated drama – not to mention a desire for a life of my own- so giving the children my undivided attention seemed like an impossible task and caused me enormous guilt. Then, as a teacher, I realized that my students, like my children, were starved to be seen and heard, and I strived to give each one my full attention, if only for moments at a time, but it was never enough and I felt inadequate. Now, challenged with this illness and unable to give much of anything to anybody, I realize that it is I – my body/mind/spirit – that needs me to be fully present and aware. It is no longer okay to feel not good enough. Guilt, you have no place here. 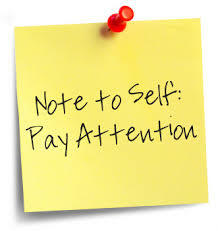 I am learning all over again about the benefits of undivided attention.